Independence Day is a marvelous thing. You get a day off work, an(other) excuse to grill, and possibly the greatest sporting event of the year: Nathan's Hot Dog Eating Contest. This year the culinary combat at Coney Island goes down Monday morning, July 4th, as Nathan's contest celebrates its 100th anniversary. Bun crumbs will fly, condiments will go ignored, a highly advanced alien race will surely visit Earth and immediately turn around, and in the end, two great champions will walk away with $10,000 in prize money, a mustard-yellow champion’s belt, and the most attractive Tinder profile pictures in the country. Thomas Jefferson would be proud. Because it's worth discussing how we arrived at this nexus of human achievement, we rounded up everything you need to know about Nathan’s Hot Dog Eating Contest. If you’ve only heard of this in passing, let’s be clear: it’s a national event. The contest itself draws 40,000 people to Nathan’s Coney Island flagship in Brooklyn. It’s been broadcast on ESPN since 2004 and drew 9 million viewers total on July 4th, 2015 (including two re-airs); for comparison, 1.2 million people tuned into ESPN to watch Novak Djokovic win Wimbledon last year. This year the women’s competition begins at 11am EST on ESPN, while the men’s competition starts at 12:30pm EST. Last year’s winner was a 23-year-old named Matt “Megatoad” Stonie, who beat reigning champion Joey “Jaws” Chestnut by just two dogs in a dramatic upset. Before that, Jaws had won the contest for eight years in a row. Chestnut’s response: "I've been looking for competition for a long time and I finally have it," he told ESPN. "He made me hungry." They’ll both be back this year. Here are some of the competitive eating nicknames on the roster for this year's contest. Women ate alongside the men in the contest until 2011, when a separate competition was created. The first champion in the women’s contest was Sonya "The Black Widow" Thomas, who ate 40 hot dogs in 10 minutes. This year she’s up against Miki Sudo, who won last year’s contest and has taken no nickname except this fun Twitter joke. During the competition’s co-ed history, most women never made it past third place. The last one to win it all was Birgit Felden in 1984. Coming from Cologne, West Germany, she was also the first non-American to win the contest, eating 9.5 hot dogs in 10 minutes, a tiny amount compared to today's gold standards. The insane hot dog count has only gone up since 1984. By 2001, Takeru "The Tsunami" Kobayashi, shocked everyone by setting a then-world record of 50 hot dogs with buns in 12 minutes. 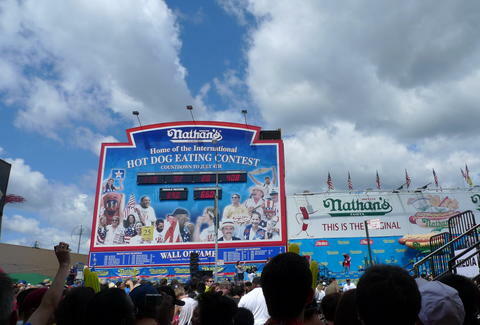 The contest was shortened to 10 minutes in 2008, and the record now stands at 69 hot dogs with buns in 10 minutes, achieved by Joey Chestnut in 2013. Which makes those records all the more impressive. Your esophagus responds to fatigue and intense stress just like every other muscle in your body, and it’s not designed for rapid-fire consumption like this. "These people put themselves at risk of esophageal tears, aspiration, nausea and vomiting, distention and abdominal pain," one cardiologist told Mic. The time limit is 10-minutes. Yellow penalty cards are issued for "messy eating." Disqualifying red penalty cards for regurgitation. Ties will be decided with a five-hot-dog eat-off. Further ties will be decided with one-hot-dog sudden death rounds. Former six-time champ Kobayashi was actually arrested in 2010 for trying to jump the fence at the contest. Previously Kobayashi had refused to sign an exclusive contract with MLE, telling CNN through an interpreter at the time that he earned his livelihood through competitive eating, and a contract would prevent him from competing elsewhere. The charges were eventually dismissed, but Kobayashi’s name and photo were removed from the Wall of Fame in 2011. Oddly enough, there’s a quirky cultural cachet around competitive eating. Even former NFL player William "The Refrigerator" Perry got in on the action in 2003 as a celebrity contestant (he called it quits after four hot dogs). In the present-day, including a photo of yourself on Tinder standing next to a competitive eater with a trophy and the mustard-yellow belt is a great conversation starter. Trust me. 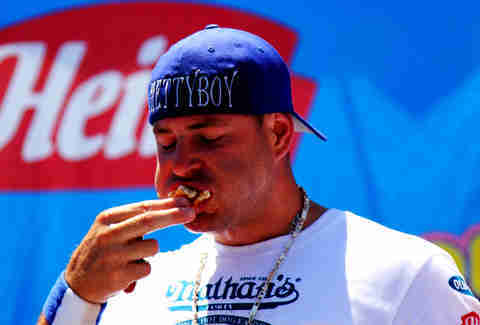 Eric Vilas-Boas firmly believes we are all wieners and losers in the noble sport of hot dog eating. Send him better puns to chew through on Twitter.